CityArts is hosting the opening of three new exhibits from 5-8 p.m. on Final Friday, July 31 that celebrate the work of artists in the Wichita area. and 9 a.m.-4 p.m., Saturday. CityArts is located at 334 N. Mead in Old Town Square. The shows opening on Final Friday will be on exhibit through August 22. For more information about the shows or to purchase artwork, please contact CityArts at 316-350-3245 or cityarts@wichita.gov. Kathleen Shanahan’s artwork has been exhibited all over the world. Her images combine elements and characters in unlikely contexts through juxtaposition and collaging. Her method of creating art allows viewers to come to their own conclusion about their meaning and back story. Ranal Harrell Young’s thought-provoking work is diverse and imaginative. His process of finding and manipulating materials add another level of meaning to his pieces. CityArts is excited to partner once again with the Arc of Sedgqick County for the 3rd annual art show in honor and celebration of Ruthie Spriggs who for 30+ years taught and inspired children and adults of all abilities. Through her love of art she sparked their inner artists and taught them to express themselves through their work. Featuring work by those with developmental disabilities across the state of Kansas this multimedia show is one of CityArt’s favorite of the year. Sydney Peterson is a 10-year-old artist who continues to impresses audiences with the maturity of her work. She has been drawing since the age of four and considers art to be one of her favorite past times. She also has a preferred subject matter. Perterson will take drawing dragons and animals over bowls of fruit and landscapes any day. The reason she draws is simple, “Making art makes me feel happy, calm and relaxed.” This young artist has an understanding of art that is pure and can inspire people of all ages. Birger Sandzen’s, “Autumn, Kansas River (Smoky Hill River)”, oil on panel, 30″ x 25″, 1943 in excellent condition. Signed, titled and dated on the back. For July 31st Final Friday, 6:30 – 9:00 P.M.
*This show contains images of a very graphic and sexual nature. We do not recommend for anyone under 18-years-old. Friday, July 31, 7:00 – 10:00 p.m.
Just use the link below, or go to the website and click on the yellow SUMMER PRINT SALE banner and you will be directed to the online sales page. Several images by Gallery Director, Linda Robinson are featured on this page. Just click the buy now buttons below each image to make a purchase in your preferred print size. All photographs are mounted and framed and are shipped directly to your door. We wish to thank you in advance for your continued support of MWCP through your purchase of collectable fine art photography. You are most cordially invited to celebrate TISSU Sewing Studio’s One-Year Anniversary with art, food, fun and friends! July 31, 2015 from 10am to 9pm. We have wonder emerging artists and very colorful displays. From photo prints, swags, reliefs, to canvas art and all are very affordable, many under $300. Visitors can come and greet the artists and enjoy a few snacks, drinks, and free wine as it lasts. The Sunflower Plaza will be permanently closing our doors on August 1, 2015. Join us as we celebrate Sedgwick County’s arts, culture and services that make our home a great place to live, work and play! Arts, culture, and services are a vital part of our county’s future, we all know that. We also know that funding for many programs in Sedgwick County is slashed in the current budget proposal. This is an all-inclusive event for every organization’s supporters to show their displeasure with the County’s decision to drastically cut the funding of groups essential to our community. The organizations being cut enhance our quality of life, promote economic development and help build vibrant and connected communities. Contact your County Commissioners today to let them know why they matter to you! Come out Friday and show them! Emcee Power 93.5’s Miranda Watkins, D.J. Carbon, Operas Kansas, Phlox Fire Troupe, SmorgasChorus, Blue Moon, Richard Crowson, Pax the Magician. Our May Resident Artist Wayne White said his Wichita crew of assistants was “one of the best I’ve ever worked with, I wish I could take them with me everywhere.” Now, some of this amazing group of local artists have taken the experience of building cardboard puppets for the Riverfest’s Sundown Parade and are now hard at work creating something of their own. Using the materials and processes learned from Wayne, these artists are creating sculpture, animation, and cardboard environments in an exhibition titled Corrugated Cellulose. Bernardo Trevizo Jr., Patrick Calvillo, Mike Miller, Meghan Miller, Michelle Calhoun, Alli Sutton, Emma Ehart, Richard William Kopp, Jon Ashton Rushing, Jordan Kirtley, Drew Davis, Jessica Wasson and Robyn D.S. Animation created with the sculptures will be screened. It is in this pursuit that we stand proudly as a brand with real meaning. Brickmob produces raw art, hand printed in the American Midwest on high quality materials and stylized gear while using eco-friendly techniques whenever possible. Proud Wichita artist bringing repurposed life to pieces others have discarded. If you’re looking for Wichita-focused art, you can’t miss checking out Johnny’s work! Proceeds will go to St. Jude’s Children’s Research Hospital. Local artist Tyler Rosenboom selected the charity for the evening. He will bring his paintings inspired by his time as a baseball player at Newman University in an exhibit titled America’s Game. Bright and bold, the art delivers the energy and spirit of the game on canvas. July 31, Marks the opening of the sixth annual Crazy Eights Small Works Invitational. We are very excited to welcome Charles Baughman, co-owner of MonArt as this year’s juror. Over 75 artists will be represented! We will also be featuring the ceramic works of Judy Brees. Awards will be presented at approximately 7pm. 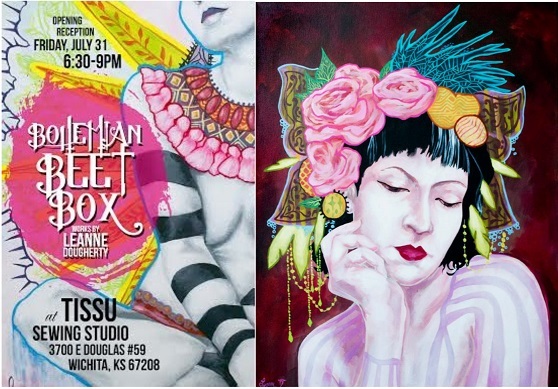 Final Friday, July 31st at 5:30 p.m.
A very special summer art event for Wichita. Ruthie Spriggs was an art teacher at USD 259, CityArts and Arts Partners. She has touched many lives teaching art to so many. She past away this last September. This Exhibit is a tribute to Ruthie Spriggs.